In this audio recording from a call with the THRIVE Movement team, filmmaker Foster Gamble highlights more good news about courageous people standing up for truth and justice all around the world. Hi everyone. I’d like to welcome you to Good News Tuesday, Episode 5, recorded on September 17, 2013. I want to challenge you today to cope with an absolute deluge of good news. 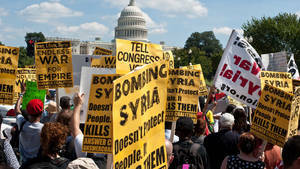 First of all, I just want to mention Syria, not in detail, but just from the distant perspective to just pause and notice (as I’m enjoying doing) that when President Obama and the usual New World Order gang of Biden, Kerry, McCain, Lieberman, Graham, Feinstein, and the others who keep pushing for each war tried to do it this time, basically, the world stood up and said “No!” They weren’t able to get NATO to go along with it. They weren’t able to get the U.N. or the Vatican, Russia & China, most of Europe. The Congress was strongly against it even though they never had to vote. And most of all, I’m just proud of the U.S. population in such great numbers saying “No!” And this is without most people even knowing that the gas attacks were probably CIA-sponsored false-flag attacks as stated by local witnesses, by Vladimir Putin, and by President Assad himself. To me, that’s just a real marker. It’s a milestone that’s very encouraging in terms of the Internet and alternative media and courageous reporters getting the news out about what’s really going on enough that the tide is turning with outrageous acts of aggressive war like this. Next, you probably saw that Larry Summers has withdrawn his name from consideration for head of the Fed and he cited that his confirmation process would be apt to be acrimonious. Yes, acrimonious and it would reveal in detail the role that he played in the 2008 financial collapse as well as the subsequent bailout theft by the big banks. Someone will be put in his place who will probably do the same thing he did, so maybe it’s too bad that we didn’t get that further exposure, but the fact that he couldn’t really step into that role is encouraging to me once again in the same way that when they tried to appoint Henry Kissinger the head of the 9/11 Commission, the uproar was so great that he had to back away from that. Next, Hungary has really joined Iceland and Russia in kicking out the Rothschild bankers. Their Prime Minister, Viktor Orbán, recently told the IMF that Hungary neither wants, nor needs assistance from the Rothschild-owned Federal Reserve bank and, therefore, the Hungarians will no longer be forced to pay usurious interest, in his words, “to private, unaccountable central bankers.” So, instead, the Hungarian government has assumed sovereignty over it’s own currency and now has had a rapid recovery and they paid back early a €2.2 billion debt to the IMF and is now done with all of their obligations there, so they’ve demanded that the IMF close it’s offices and, basically, get out of Hungary. It’s a huge step to have one more country not only do it, but do it successfully and get the reward. In the long run, a nationalized bank is not what Thrive is suggesting, but as an interim term, taking it back from the Rothschild private bankers is a good Stage 1 step in our solutions strategy. Next, I was delighted to see that The Netherlands just closed eight prisons due to a lack of criminals. That cracked me up! I read on to see why and in one report, they said that the Criminal Justice Alliance, which represents more than 60 organizations in The Netherlands, called for the government to urgently limit what they quoted as “the unnecessary use of prison, ensuring it is reserved for serious, persistent, and violent offenders for whom no alternative sanction is appropriate.” I think it’s no coincidence that The Netherlands has really been a pioneer in terms of not having victimless crimes such as drug use. This is showing up and you can see why the private prison industry is afraid of the decriminalization of people being able to choose what herbs they ingest. The next one is a brief addendum to our previous Good News on Monsanto and GMOs. The city of Rotterdam (while we’re in The Netherlands) has just passed a ban (it went from a petition ultimately to a “green initiative”) banning the use of Roundup, their most popular pesticide, within the city limits. Basically, what they’re calling it is an effort to make the city safe for their children because they’re well-aware that the glysophate chemical causes respiratory distress, cellular damage, even cancer. So, the people of Rotterdam have taken a stand to eliminate it from their local environment. Next, PepsiCo’s’ so-called “naked juices” have been mandated to drop their “all natural” label after a $9 million class action lawsuit was won against them because they’re labeling it as “natural” and “non-GMO” when, in fact, it does have GMO, synthetic, and other unnatural items. In the nuclear area, the Vermont plant, the one that Entergy owns called the Vermont Yankee Nuclear Plant, the state has decided that it’s going to close down that plant. They’re saying for financial reasons because they would have to invest hundreds of millions of dollars more to meet the modifications that are now required because of Fukushima, but I think behind the financial reasons is really the awareness that these things are tremendously expensive to build, to repair, to update, and especially to insure and so the fundamental danger of this plant and many more like it is now being called into question and people are taking action. Along that line, I saw a wonderful report that the cost of renewable energy in the U.S., particularly in the areas of wind and solar, has dropped more than 50% in the last 4 years and is now being considered as competitive with fossil fuels for most parts of the world, even before subsidies are taken into account. Those costs are expected to drop even further and, basically, the company that’s doing this research, Lazard, is also suggesting that the future of renewable energy sources lies in the roll of “distributed small-scale generation”, which I think leads perfectly to free energy devices. Finally, in the area of fracking, in Youngstown, Ohio (which is very near where I grew up), they’ve linked a spate of over 100 earthquakes to the process used to dispose of waste water from hydraulic fracking. In Greenbriar, Arkansas, there weren’t hundreds of them, there were thousands of small earthquakes and as soon as the Arkansas Oil & Gas Commission had to shut down the wells, the earthquakes stopped and they have acknowledged that they were the cause and they just say “well, it’s a small percentage of our fracking operations which cause earthquakes.” But it was over five federal lawsuits that got proposed by the residents of Greenbriar that, finally, the company had to back off. And then (and this is just the beginning) in our local area of Santa Cruz, where Kimberly and I and a lot of our team live, we just saw an article that the Santa Cruz County Board of Supervisors has taken preliminary steps towards toughening local rules governing the controversial practice of hydraulic fracturing because it turns out that the mother lode of this type of gas is supposedly on the central coast of California and part of southern California and one of the major deposits, potentially, is in the forest of Nisene Marks [State Park], which literally backs onto our property, right here. I’m proud once again of the critical thinkers in Santa Cruz who stopped the moth spray that we talked about in the film and also was the first county to ban smart meters are now already standing up in a preemptive way against fracking. I could go on, but I’m thrilled to be able to share this much good news with you and my final question I want you to consider is “What do all of these different bits of good news have in common?” For me, what they have in common, mostly, is courageous people organizing and standing up for the Truth and for the restoration of whole, natural systems, whether those systems be in banking, justice, energy, food, or any other area. This is the essence of the Thrive Movement. It’s what works. It’s what we stand for. It’s the purpose of our Solutions Hub (which you can visit at www.thrivemovement.com/solutions-hub). Please, I invite you to join us and over 850 groups around the world who are on that Solutions Hub site to build the infrastructure and the momentum to transform every area where violations are threatening our freedom and our health and our prosperity. 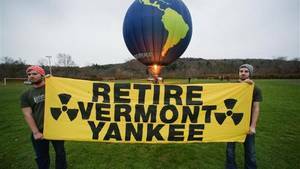 In Victory for Activists, Entergy to Close Vermont Yankee Nuclear Plant — Democracy Now!